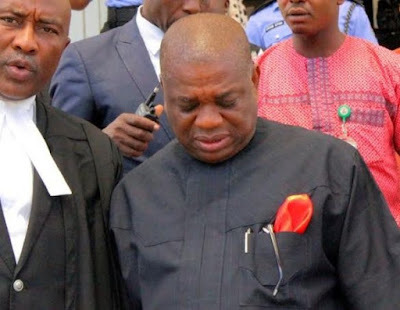 An accountant in Abia State Government House, Akpan Udoh, who is scheduled to testify in the ongoing trial of former Abia Governor, Orji Uzor Kalu, is now on the run, the prosecution told a Federal High Court in Lagos on Monday. Udoh is listed as a witness for the Economic and Financial Crimes Commission (EFCC). The EFCC had on Oct. 31, 2016, slammed a 34-count charge bordering on N3.2 billion fraud against Kalu and his former Commissioner for Finance, Ude Udeogo as well as Kalu’s company — Slok Nigeria Ltd. So far, the prosecution had called no fewer than 12 witnesses since the trial began. According to NAN, at the resumed trial of the case on Monday, the EFCC Prosecutor, Mr Rotimi Jacobs (SAN) called the 13th prosecution witness, Mr Tobore Ovie, who introduced himself as an operative with the EFCC, whose work schedule include investigations of economic and financial crimes. Led in evidence by the prosecutor, the witness told the court that on Jan. 15, he was instructed to proceed from the commission’s Port Harcourt office to Umuahia to locate the residence of Akpan Udoh, an accountant in Abia State Government House, who is sought to be called as a prosecution witness. He said he linked up with the State’s Attorney General, who called the Accountant-General of the state who in turn took him to where Udoh is supposedly living. According to the witness, operatives of EFCC gained access to the property of Udoh the following morning and met Udoh’s wife and children. He said that the operatives were told that Udoh had travelled out of town. The witness said that after obtaining Udoh’s phone number from his wife and consistently failed to reach him on phone, he then left his own number with Mrs Udoh with an instruction that there was a pending case in court which required her husband’s attention. He also instructed her to inform her husband to call him back. He told the court that since there was no response from Udoh, he got another instruction on Feb. 15, to proceed to Umuahia with a court order to be served on the Accountant-General and Udoh. The witness said he had served the order on the Accountant-General, who acknowledged same, adding that when he arrived at the residence of Udoh, he discovered that it was under lock and key and only saw some youth corps members in the adjourning apartment. He said a media team of the EFCC also accompanied him on the journey and had a video recording and shots of the premises. The prosecutor then tendered copies of the orders before the court and they were admitted and marked as exhibits. Meanwhile, when the prosecution sought to tender the video the defence raised an objection, arguing that by the provisions of the Evidence Act, only the maker of such recording could give admissible evidence on it. Following the objections, the prosecutor withdrew the DVD and informed the court that he had no further questions for the witness. Justice Mohammed Idris adjourned the case until March 20 for cross-examination. Kalu and others allegedly committed the offences between August 2001 and October 2005. Kalu’s company — Slok Nigerai Ltd — and a man, Emeka Abone, who is said to be at large, were also alleged to have retained in the company’s account the sum of N200 million on behalf of the first accused (Kalu). They were alleged to have utilised Manny Bank, (now Fidelity Bank Plc), Spring Bank Plc, the defunct Standard Trust Bank and Fin Land Bank, now First City Monument Bank (FCMB). The accused allegedly retained about N2.5 billion in different accounts which funds were said to belong to the Abia Government. Cumulatively on all the counts, the accused diverted over N3.2 billion from the Abia State Government’s treasury during Kalu’s tenure as governor. The offences contravened the provisions of sections 15(6), 16, and 21 of the Money Laundering (Prohibition) Act, 2005, the Money Laundering Act of 1995 (as amended in 2002) and Section 477 of the Criminal Code, Laws of the Federation, 1990.